Time to eat! Adora’s Pink High Chair is perfect for breakfast, lunch, dinner, snacks and every meal in between! Beautifully crafted, this Pink High Chair is made to fit most dolls, stuffed animals and plush up to 16 inches. It features a lovely baby pink & grey print with signature Adora hearts in pink & blue, and even has a security belt to keep your baby dolls safe and sound. Made with high quality materials and fabrics, this lightweight high chair makes food time fun and easy! Comes assembled with security hooks on either side and can be folded up for easy storage. Image all the wonderful memories your little one will make while “feeding” their baby doll in this high chair. 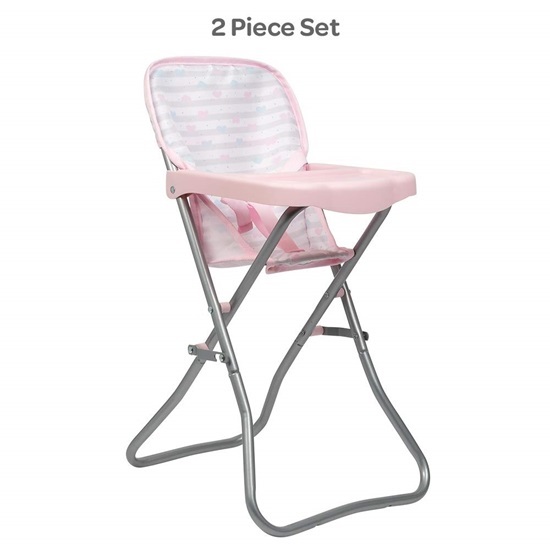 Perfect for little mommies and daddies, this Pink High Chair is a must-have baby doll accessory! Perfect for ages 3 and up.